Sugar interests use every tool at their disposal to obstruct science-based policy on added sugar. Full report Appendix B: Letter from Corn Refiners Association et al. to the World Health Organization Appendix C: Lobbying and Political Contribution Analysis Appendix D: Western Sugar Cooperative et al. v. Archer Daniels Midland et al. Sugar. We think of it as a sweet treat, but it hides in everything from barbeque sauce to yogurt to salad dressing, added to foods before they ever reach our plates. Scientific evidence has shown that overconsumption of added sugar has serious health consequences: heart disease, obesity, diabetes, and hypertension have all been linked to high consumption of added sugar. And yet Americans continue to consume large amounts of hidden sugar every day, and our food policies do not reflect the scientific evidence on this health risk. A major factor that has kept us in the dark about sugar’s detrimental impacts is the role that industry has played in keeping it that way. Sugar interests—food and beverage manufacturers along with industry-supported organizations such as trade associations, front groups, and public relations firms—have actively sought to ensure Americans’ consumption of high levels of sugar continues. 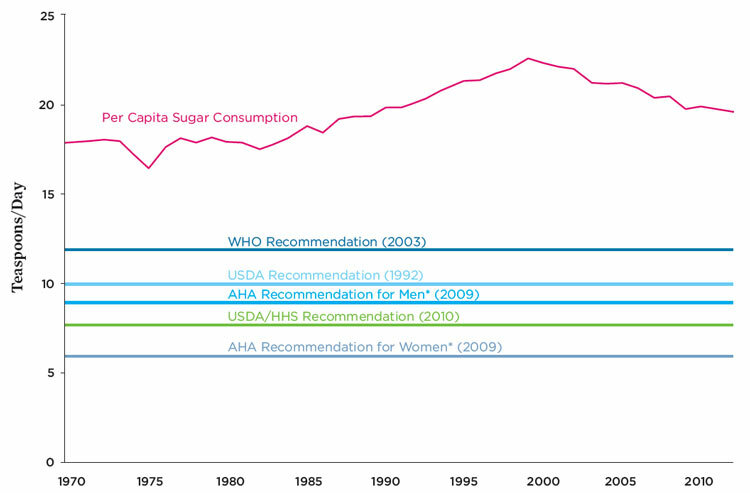 Graph showing U.S. per capita sugar consumption compared to recommendations from public health authorities. Researchers refusing funding from conflicting interests. Several health scientists have pledged not to accept funding from sources with financial interests in their areas of study, and in 2009 22 public health experts resigned from the American Academy of Family Physicians in protest against the AAFP's partnership with Coca-Cola. Soda tax in Mexico. In November 2013, Mexico made history by passing an excise tax on soda. Mexico is earmarking the soda tax revenue to give children access to clean water in schools. Nutrition and physical activity programs in Massachusetts. Massachusetts recently reported a drop in childhood obesity following a policy intervention in which schools implemented healthier school lunches and promoted more physical activity. Empowering individuals with nutrition information. Fooducate is a mobile application that brings the power of information to the shopper’s hand. The app helps consumers glean the quality of calories from a product’s barcode by analyzing the product’s nutrition label. Investors and citizens should pressure companies to align their public messaging with science and to cease funding trade and front groups that spread misinformation about the link between sugar and adverse health effects. Congress and federal agencies should enact policies to enhance transparency around corporate political activities so that members of the public may know who is influencing policies that affect their health. The U.S. surgeon general should conduct a comprehensive report on the health effects of added sugar, and issue a Call to Action to encourage health policies that curb added sugar consumption. The National Prevention Council should give serious weight to the evidence already found by the scientific community on the ill-effects of sugar as it implements the National Prevention Strategy and works to make all Americans healthier. The Food and Drug Administration should implement a strong rule requiring the inclusion of added sugar in nutrition labels. The 2015 Dietary Guidelines for Americans, issued by the USDA and the HHS, should include strong language encouraging Americans to limit added sugars in their diets. The U.S. Department of Agriculture should include a strong added-sugar restriction in rules that set nutrition standards and should ensure compliance in every school. State and local jurisdictions and institutions should use the best available science on sugar’s health impacts to develop robust nutrition policies. Federal, state, and local health agencies should develop aggressive public information campaigns to counter misinformation from sugar interests.